The release of our Marketplace is a huge step in completing our vision to bring commercial real estate online. Model and market your deals using the same data backbone the big enterprises use — with the convenience of the Web and the confidence of standardized data. 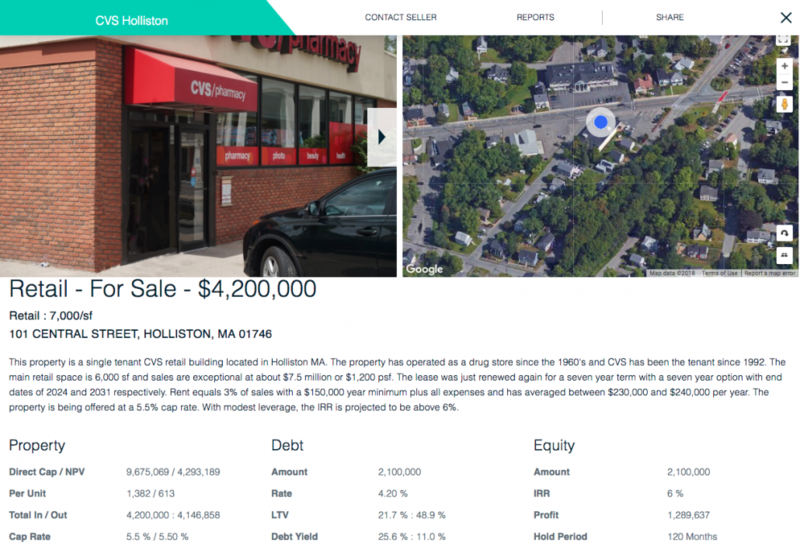 Our first public for sale listing is a $4.2 million retail property near Boston. This property is owned by my family (I’m not just the president of CMBS.com, I’m also a member). Check out the property and make an offer here. More properties will be listed as we build up our user base and develop strategic partnerships. In addition to for-sale listings, the marketplace also contains information on more than 100,000 properties that either have or had CMBS debt on them. If you are a property owner with CMBS debt, find your property in our database and add it to your CMBS.com account. Once the property is in your account you can easily monitor what your servicer is reporting as well as manage your financial reporting responsibilities. You can also browse the CMBS marketplace for market information and deal leads. We make getting started on CMBS.com easy with instructional videos. MISMO’s rent roll standards bring consistency, efficiency and accuracy to exchange of key property data. Easily export your rent rolls in MISMO format. CMBS.com accounts are free in 2018. Learn more and sign up at www.cmbs.com. Look out for another round of new goodies before summer is over. If you have any feedback, please send it to me at jim@cmbs.com.